Be embraced, meditate, snap a picture, and let the lights inspire you to sing, dance, and play. Take a moment to interpret the patterns and colour in Space Folding. Space Folding by Zina Kaye is a 3 metre high and 3 metre wide tower that beckons you. The architectural star above you creates a focal point of excitement. You observe and explore the shifting patterns of multi coloured light as Space Folding visualises live flight data across more than 1600 LED Lights. Step through the 1.5 metre aperture into the stargate itself. Here you find a world of possibilities beyond the place where you exactly stand. Be absorbed by the rhythmic morphing of light and imagine the journey behind each flight. Become enveloped in the twists and turns as the data races around the structure itself. Engage with flight data from the local area, learning about what each pattern shows as flights arrive, depart and fly around Space Folding. 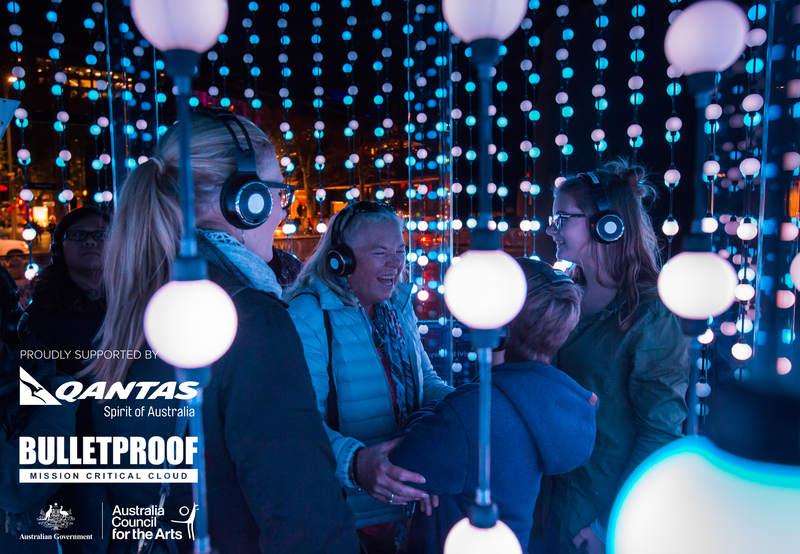 Space Folding was on show as part of Vivid Sydney 2015 thanks to the support of Qantas. The towering stargate was in pole position in the heart of Sydney on the corner of George Street and Alfred St underneath the Cahill Expressway. For Vivid 2015 Space Folding was developed further and accompanied by a synchronized soundtrack. Forged in collaboration with award winning lead composer Peret von Sturmer the audio constantly evolves, driven by the same real-time flight data. The generative composition was live streamed and available via your smartphone through the link bellow thanks to our friends at Bulletproof. The experience created a real sense of wonder, prompting questions and discussions about place, culture and the interconnected nature of our world. In keeping with our own environmental targets Space Folding used extremely low energy LED lighting and runs from a single standard plug. The structure itself is built from recyclable and reusable materials to keep waste to a minimum and continue the effort to safeguard our environment. Space Folding - engage, explore, feel wonder.